If you’re looking for a fun project this spring, why not use the upcoming Easter holiday as your inspiration? 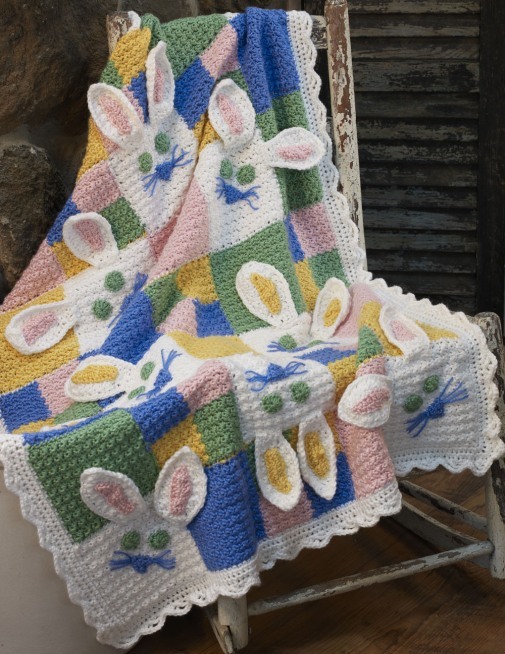 This lovely hand-crocheted blanket from Create and Decorate is the perfect treat for the Easter season! You can find the pattern designed by Deb Richey here! This year, take stock of all the projects you haven’t finished. Some of them probably only need minor work to finish them such as weaving in ends, blocking your knitting or simply doing some knitting up. Make these sorts of projects a priority and see how many of them you can complete before the end of January. Other pieces might take much more work to finish. Consider each one individually and decide if it is something you really want to finish. If you abandoned the project part way through because you hated the yarn or the pattern, that’s not a project you are ever going to want to finish. Bite the bullet and unravel your work. If you like the yarn but hated the project, try a different pattern. Donate the yarn if it was the problem. If you have unfinished projects that you still want to finish, make an effort to complete them, if possible, before you start any new projects. If you started the project for an occasion that has since passed, find a place to donate the finished item. Do you have an idea for a project you could make with it? Do you have enough of it to complete that project? Is the yarn in good condition? If you don’t love the yarn, donate it to someone who can use it (or sell it on eBay). If you love it but don’t know how to use it, check out our free knitting patterns section for some inspiration. You might find a small project you could complete with a tiny quantity of yarn, or come up with a way to work the yarn into a project that uses many different kinds of yarn. If the yarn is damaged, there’s nothing for it but to get rid of it and make room for something else in your stash. Once you’ve cleaned out your stash and come up with projects for some of the yarns you are keeping, resolve to make those projects. Either set a goal of one project from the stash every month or vow not to buy any new yarn until you’ve completed a certain number of projects from the yarn you already have. Most knitters don’t like to take the time to knit gauge swatches, yet we all probably have a story involving a project that we should have swatched. My first pair of socks, for instance, ended up more like slippers because I was sure I could just knit with the size of needles that was recommended in the pattern. They were such small needles, I figured there was no way my knitting wouldn’t end up small. I still wear those socks, but often they’re put on over other socks! This year, let’s all resolve to try to make more gauge swatches when we embark on difficult or extremely fitted patterns. Notice I didn’t say you have to make a gauge swatch for every project, or even that you have to keep them, I just said try to make them on the difficult or big projects you don’t want to have to knit twice. Making resolutions, whether about knitting or anything else, shouldn’t be about absolutes. Don’t say “I’ll never eat ice cream again” or “I’ll always make gauge swatches and knit from my stash.” With that kind of attitude if you mess up once your resolution is gone. Instead, make a day to day, project to project effort. Every knitter, no matter how skilled, probably has something he or she hasn’t tried before. Make this the year you learn that skill you’ve always wanted to try. Whether its felting or cables, colorwork or circular knitting, be willing to move out of your comfort zone this year and try something new. 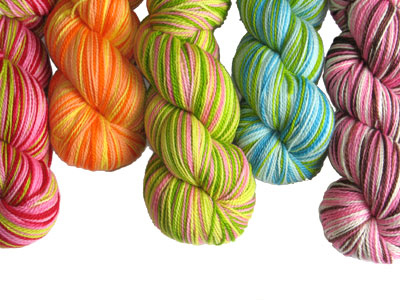 You’ll learn great things about yarn, about knitting, and about yourself. Even if it’s a disaster, it probably won’t be one you regret. 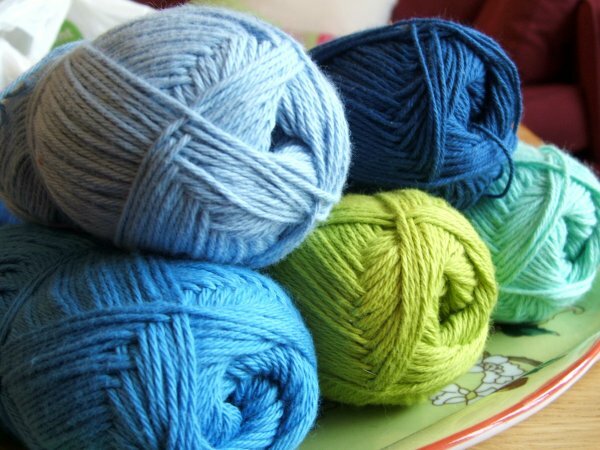 It’s likely most of us would like to be able to spend more time knitting each day or each week than we currently do. You could resolve to do more knitting in front of the television or to turn off the TV one night a week so you can get more knitting done. You might also want to join a knitting group so you have a regular time for knitting worked into your schedule. You might be more likely to take part if you know people are expecting you. 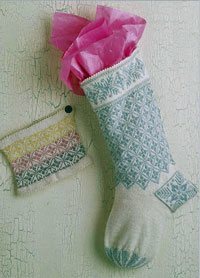 If you’re constantly knitting for gifts and for charity, good for you, but remember to stop every now and then and knit a little something for yourself. You’ll be glad you did. Finally, the greatest New Year’s resolution of them all: take some time to thank the person who taught you how to knit. We all had the pleasure of learning this wonderful craft from someone, often a family member or friend. If that person is still alive and you are still in contact with him or her, send a note (not an e-mail if at all possible) telling them what it has meant to you to be able to knit. If you want, make them something nice to show them how far you’ve come. They’ll love it. If the person who taught you is not longer living, pay it forward by teaching someone else to knit or helping them with a knitting skill. We are the ones keeping knitting alive. We owe it to those who came before us to ensure there are knitters after us. Even if you only choose to set one of these resolutions for yourself, I’m sure you’ll be glad you did. They’ll make you a better knitter, and maybe even a better person. Happy New Year! Just in case you’re in the need for a last minute costume or want to get a head start for next year, check out these cute crocheted kitty ears! 1 Skein No. 312 Black. Ears measure approx 2.5″ high. 14 sts = 4″; 8 rows = 4″ in sc. CHECK YOUR GAUGE. Use any size hook to obtain the gauge. Ear (Make 4): Ch 8. Row 1: Sc in 2nd ch from hook and in each ch across; turn – 7 sc. Row 4: Ch 1; draw up a lp in each of next 2 sc, yarn over and draw through all 3 lps on hook – sc2tog made; sc in next 3 sc, sc2tog over last 2 sc; turn – 5 sc. Row 6: Ch 1, sc2tog, sc in next sc, sc2tog; turn – 3 sc. Row 8: Ch 1, draw up a lp in each of next 3 sc, yarn over and draw through all 4 lps on hook. Fasten off. Finishing: Sew 2 ears together along the 2 shaped sides leaving bottom open. Repeat with other 2 ears. Checking placement, sew bottom of ears to headband. Weave in ends.